I’ve never preached a Holy Saturday service. Christians also call it Great Saturday, Easter Eve, or Black Saturday. If you do a Lenten reading of the Gospels, going back forty days and planning ahead to read the resurrection stories on Easter, Holy Saturday reading is pretty easy. The women who had come with Jesus from Galilee followed Joseph. They saw the tomb and how Jesus’ body was placed in it. 56 Then they went home. There they prepared spices and perfumes. But they rested on the Sabbath day in order to obey the Law. Verse fifty-five is for context. Verse fifty-six is it, and only the second half. They went home and prepared spices and perfumes on Friday, before their shabbat, their sabbath, had started. Jews observed the sabbath from sundown to sundown. This day, this Saturday, is also referred to as The Great Sabbath. What happened during the Great Sabbath? Nothing. The women followed the Jewish law by resting on the Sabbath. Nothing changed. Jesus was taken and murdered, except it was state-sanctioned so we call it “executed,” betrayed by the religious leaders, who lied and framed him during his mockery of a trial, then turned him over to the soldiers who occupied Israel, who hated the Jews and with a full-throated, racist hatred. That sign, “The King of the Jews?” Step back from the double-meaning that you might know and think about that. They took a Jew and beat him viciously, then put him in a robe and “crown,” laughed at him and spat on him, then made a sign to let the world know that this ragged, bleeding criminal was the Jewish King. 20 Many of the Jews read the sign. They wrote in three different languages, “The King of the Jews. : They wanted everyone in sight, anyone who could read, to grasp that there would be no Jewish uprising, no Jewish King. This is what happens to a Jewish King. Conquering armies conquer, and when there is any threat of rebellion, they usually crush it ruthlessly, violently. When King Herod thought there was the slightest chance of a baby growing up to overthrow him, he had all the children three years old and under slaughtered. All of them. That’s the power ruling on Saturday afternoon. Saturday afternoon, Jesus is dead. The women are resting because that’s the law on the sabbath. The soldiers are soldiering, doing their duty. Beating and flogging and humiliating Jesus, that was just their duty, maybe something they enjoyed more because they really did hate the Jews or less because “let’s just kill him and be done with it.” Pilate went back into his palace. The crowds disbursed. Joseph of Arimethea, who was on the Jewish Council. had not only a change of heart but such a transformation that he dared take responsibility for a dead criminal and provide him a place of honor to bury him. He took Jesus and had him buried in an empty tomb, not a pauper’s grave, not just tossed by the side of the road. It was a strange decision, to put this stranger, this false prophet, in an honored place of burial, where no one had been buried before. Then Joseph went home and rested, too, because anything that could be done, he had done. Everything changes on Sunday. Literally everything changes for us. Is is Saturday or Sunday? It was very early in the morning on the first day of the week. The women took the spices they had prepared. Then they went to the tomb. 2 They found the stone rolled away from it. 3 When they entered the tomb, they did not find the body of the Lord Jesus. 4 They were wondering about this. Suddenly two men in clothes as bright as lightning stood beside them. 5 The women were terrified. They bowed down with their faces to the ground. Then the men said to them, “Why do you look for the living among the dead? 6 Jesus is not here! He has risen! Remember how he told you he would rise. It was while he was still with you in Galilee. 7 He said, ‘The Son of Man must be handed over to sinful people. He must be nailed to a cross. On the third day he will rise from the dead.’ ” 8 Then the women remembered Jesus’ words. 9 They came back from the tomb. They told all these things to the 11 apostles and to all the others. 10 Mary Magdalene, Joanna, Mary the mother of James, and the others with them were the ones who told the apostles. 11 But the apostles did not believe the women. Their words didn’t make any sense to them. 12 But Peter got up and ran to the tomb. He bent over and saw the strips of linen lying by themselves. Then he went away, wondering what had happened. First thing Sunday morning, nobody knows anything has changed yet. Think about this moment. This is our moment that I want us to understand this morning. The women wake up, probably first, certainly very early. Or maybe they didn’t sleep. I’ve been there, both ways. Have you ever woken up, felt good, felt normal, and then remembered? Maybe a tragedy, maybe a horrible situation, and it hits you again as you’re waking up, a brick to the face. You wish you could have stayed oblivious for another 30 seconds, just to not have to remember how bad things are. But they are and forgetting doesn’t change it. Even worse is when the grip of grief and shock and sorrow won’t let you go and nothing you do can pry their grip loose, not even long enough to drift off for a few minutes. 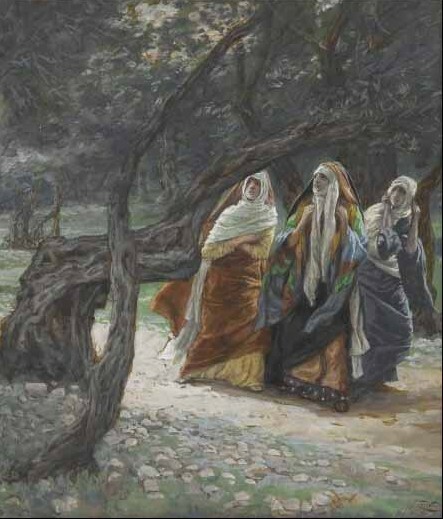 It’s “very early in the morning,” which can also be translated “at early dawn” or “before first light.” The women are trying to get to the tomb early. Do you know why? They want to dress the body before it starts to decompose. At this hour on Sunday morning, their direct concern is the practicality of dealing with a corpse. Step back. You know what’s going to happen next. You know what they’ll find when they get to the tomb. Go split screen in your mind. Picture this is what the women are talking about, this is the mood in their rooms as they light candles to go out in the dark to perform the last act of service, the final gesture of love for a man who can no longer do anything for them. Was he wrong? Were his teachings false? Was his belief in God too hopeful? Did God fail him? Do any of those questions even matter now that he’s dead? Their hearts are heavy as stone and they’re trying to follow through with an act that is the right thing to do but in the end what does it mean for this dead man? And they’re going to an empty tomb. They’re minutes away from encountering angels. They’re about to find out that everything, everything has changed and Jesus wasn’t wrong about any of it. They just couldn’t grasp what he told them. Get this: Jesus wasn’t wrong about any of it; they just couldn’t grasp what he told them. How true is that for us? When the women come back from the tomb, which does not have a dead body that “belongs” there, but which does have two beings dressed in white who don’t normally belong there, the men, the male disciples, the fishermen and the tax collector and the revolutionary, don’t believe them. 5 The women were terrified and bowed their faces to the ground, but the men said to them, “Why do you look for the living among the dead? He is not here, but has risen. 6 Remember how he told you, while he was still in Galilee, 7 that the Son of Man must be handed over to sinners, and be crucified, and on the third day rise again.” 8 Then they remembered his words, 9 and returning from the tomb, they told all this to the eleven and to all the rest. 10 Now it was Mary Magdalene, Joanna, Mary the mother of James, and the other women with them who told this to the apostles. 11 But these words seemed to them an idle tale, and they did not believe them. They think the women are looloo, loco. This may be borrowing trouble, but do they not believe them because they’re women? Women were not legal witnesses in that time and culture, were the legal property of their husbands or fathers, and I don’t think it was a mere coincidence that these women got to be the first witnesses. These were women who had faithfully followed Jesus. On one level, God gave them this in keeping with how Jesus exploded the confining, smothering, dehumanizing roles of women in their culture. Jesus taught them as he taught the disciples, making them companions among his followers, receiving financial support from them. On another level, the Messiah who taught that genuine, meaningful greatness comes from service, who washed his twelves apostles’ feet hours before he died, rewarded these women’s humble service by giving them the good news of Resurrection first. Isn’t that just like Jesus? The women came to the tomb to dress the body with spices and perfumes. For this tiny attempted action, they got to see angels, they got to hear news beyond their most desperate and ridiculous hopes. Jesus taught that a mustard seed of faith is enough to move a mountain, that giving a cup of cold water to any thirsty person is an encounter with God, that two tiny copper coins given in faith equal more than piles of coinage given for show, and their following through on this menial job instead of despairing and fleeing to their homes made them the first to switch from Saturday to Sunday Reality. But the men laugh at them, or scoff, or ignore or rebuke or scold. The women are living in Sunday morning, they have moved through darkness and despair into Resurrection and hope. Sunday morning, the men are still living Saturday. Jesus is not in the tomb, but they still believe he is. The women told them the truth, and they brushed it off. There is the Reality that exists on Sunday, and then the reality the men are still living. They’re wrong. They’re in the dark. But right in this moment they are basing all their thoughts and decisions in this Saturday reality in which they believe. He bent over and saw the strips of linen lying by themselves. Then he went away, wondering what had happened. Even so, Peter is not sure. Now his reality is somewhere between Saturday and Sunday. There’s no body there. Jesus’ corpse is not in that tomb. What happened? Faith begins when the reality we “knew” with certainty suddenly gets shaken up and maybe, maybe…this is true? U2 describes this in a song: “At the moment of surrender/Of vision over visibility” When the vision of what is True becomes more real than what’s visible to my physical eyes. That’s the moment of faith. But Peter is still going fishing on Sunday because that’s what he knows and he’s going back to the reality he lived before. Jesus is going to have to confront Peter more directly, with a lot of fish, before Peter moves all the way into Sunday reality. In which reality are we living? I’m not saying if we just believe in Resurrection, all the bad things in our world will disappear. I am saying everything changes for us, in us, and the impossible things become possible. Sunday morning, racism can change. It can. You know how I know? Slavery used to be legal. Slavery in many countries in the world became illegal when followers of Jesus spoke out against it, and fought it, and refused to accept it any longer because Jesus had changed their hearts. Jesus had taught them to see people differently. Jesus had overcome death and made the impossible, possible. Sunday morning, death no longer wins. Sunday morning, the racist hatred that killed Jesus can be overcome by Jesus love in the power of His resurrection. Sunday morning, the women go the grave to serve in the last way available to them and come back with a wild tale. They are the first witnesses to the Resurrection of Jesus who is the Christ, after all. Sunday morning, we can change the current epidemic of violence against women. The reports don’t mean it’s suddenly happening, they mean it’s finally out in the open, and in the light is where sin loses its power and God heals and restores. Sunday morning means we repent of sexism in our own relationships and then follow Jesus by speaking out and calling our churches first, and then our societies, to repentance. We aren’t living in Saturday anymore. It’s Sunday morning. That’s Peter, the same Peter whose words on Friday were, “I swear to God, I’ve never heard of this man Jesus!” This is the difference between Saturday and Sunday. Peter says this to the exact same people who tried Jesus and convinced Pilate to crucify him. Gamaliel speaks the truth of Sunday: if it is God, you will not be able to overthrow them; if you oppose what they do, you may even be found fighting against God. Did the disciples believe they could change the world? I don’t know. But they did. The disciples, by the power of God through the Holy Spirit moving in them, changed the world. That tiny little band of Jesus followers who had given up on Saturday because there was no hope left in the world saw Sunday, found out that the women were right, and then saw Jesus Christ risen from the dead, right there with them, talking with them, answering their questions, giving them a hard time for their doubts. And they proceeded to preach the Gospel and all of us who have heard the Gospel have heard it because they spoke it and it spread throughout the world. I will tell you the truth: Things look bad to me right now, in a lot of ways. Some things that I’ve prayed to see change seem to be getting worse. I know that sin and brokenness are real in the world and they have consequences. But it’s not Saturday. Jesus rose from the dead. He did. It’s Sunday and I’m going to live like it’s Sunday. The difference between knowing about God and knowing God is that if you know God, you also know that God can change you. If you know God, you’re already changed. You might have forgotten it, you might be ignoring it now, you might be doubting it, but God has changed you and will continue to change you. You’ve already lived Sunday. If you’re back to living Saturday, I get it. It’s easy to do. But it’s not Reality. That’s not the truth. This is the picture I want to leave you with. It’s not a choice between Saturday when I’m hopeless and Sunday when I know I can make things happen. This is knowing Jesus and the power of His Resurrection: If we live in Saturday, we are blind to the reality that Jesus has died and risen from the dead; we are weeping over an empty tomb. If we live in Sunday, we follow Jesus who rose from the dead and will lead us where He chooses, in His power, and He will change us and change the world through us. Our job is not to laugh at the women when they come tell us. Our job is to run to the tomb, to believe the unbelievable because we know it to be true—vision over visibility—and then to follow Jesus, to live Sunday, to let God lead us where the Spirit’s Power will open the tomb and raise the dead to life again. *This is an excerpt from my friend Erna’s blog, Feisty Thoughts. I considered including this in my sermon but didn’t. I need an Easter that has an answer for Trayvon, Tamir, Rekia Boyd, Sandra, Bland, and Stephon Clark. I need an Easter that has something to say to survivors of Indian Boarding schools, and the generations of those traumatized by its legacy. I need an Easter that has something to say about white supremacist evangelical Christianity. I need an Easter that has something to say about white women who wont’ stop crying and recentering race conversations on themselves. I need an Easter that has something to say to young queer believers who are considering suicide instead of coming out. I need an Easter that addresses patriarchy in the Korean American church. I need an Easter that sees and helps undocumented people whose families are being torn apart. I need an Easter where you don’t have to be a perfect, super special, amazing immigrant for people to care about you. I need an Easter that can dismantle the NRA. I need an Easter that can address gun violence. I need an Easter that addresses mass incarceration and the for profit prison system. I need an Easter that doesn’t just talk about living water, but gets clean water to Flint. I need an Easter where sexual violence against women, especially women of color, is talked about openly and addressed courageously. Every year Easter is about individual sin. But I need an Easter that is big enough for our collective sin and brokenness, big enough for our systemic and institutionalized brokenness. I need an Easter that goes beyond the personal. The things that overwhelm my heart and soul right now have less to do with my personal wretchedness, than the brokenness of the systems I’m embedded in, participate in, and that impact me and the communities I love. Ever consider doing a pre-edit before the post-edit? Some of us enjoy being offended..
You want to see the uncensored version? Or are you just trying to get me fired?